Who doesn’t need a good pasta recipe in their life? I know I always do! And with Memorial Day around the corner that can only mean one thing. Swimming, summer, and BBQ’s! YEEEEEEEEEEES. Are we really here? End of May, almost June. Summer? It’s happening, and I think I’m ready. I’m definitely much more ready with this recipe in my back pocket. Quick, easy, and bright flavors make for a great BBQ side dish, picnic lunch, or even dinner! Spring asparagus is booming right now and I’m taking full advantage. And don’t even get me started on cherry tomatoes. They’re like little candies in my mouth! You probably already have most of these ingredients in your kitchen! So throw this together, grab your bathing suit, sunglasses, and a towel and I’ll see you poolside. 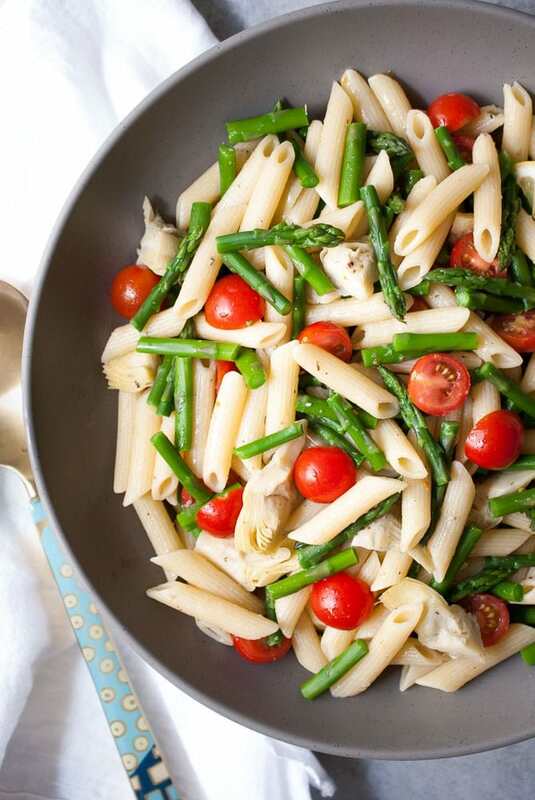 A quick and easy delicious pasta salad with fresh tomatoes, grilled artichokes and asparagus. Bring a large pot of water to a boil. Add a couple large pinches of salt and add the asparagus. Cook for 1-2 minutes, then use a slotted spoon to scoop them out and immediately place them in a bowl of ice water. Drain asparagus and set aside. Bring the same pot of water back to a boil and add the pasta. Cook according to package, about 10-12 minutes. Meanwhile, make the dressing by whisking together the olive oil, red wine vinegar, lemon juice, salt, and oregano. Once pasta is done cooking, drain and pour into large serving bowl. Toss pasta with a tiny bit of the dressing just so it doesn't stick together. Then add the asparagus, tomatoes, artichokes, and enough dressing to coat well. Toss and serve room temperature or cold! It should be against the law to read your blog when you are hungry. I love this new pasta salad and will be over to taste it as soon as you invite me. I think your photos and your gifted writing is fabulous. Thanks Toby! You know it’s always an open invite! Looks amazing! Do you blanch the asparagus? Thank you! And YES! Sorry, forgot to add that part to the directions! Just added it! Loved watching you make this on the feed feed! I’ve been thinking about it ever since and think I may try it out tonight served cold at a cookout I’m going to! Hi Kate! Thank you so much! And yes, its PERFECT for a cookout!! LOOKING FOR WEEKLY HEALTHY MENU PLAN FOR KIDS. MY 9YR OLD IS WEIGHING IN AT 105 LBS. NEED HELP FOR I DONT’ KNOW HOW TO COOK HEALTHY. I post weekly dish inspirations every week with lots of healthy options!